Rhett Halkett is a mainstay in the South African Hockey team and his brilliant defensive ability led to him securing a professional contract in Europe. The product of Wynberg High School current plays for Laren in Holland after a spell with Den Bosch. Rhett has represented South Africa at the Commonwealth Games, the Olympic Games and of course the FIH Hockey World Cup where he passed his 100th Cap for SA Hocky. 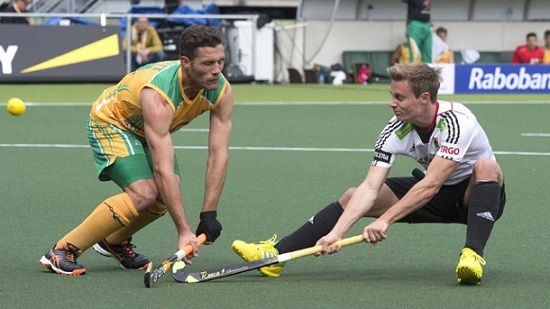 We chatted to Rhett after the recently completed Hockey World Cup about all things hockey. ATJ: Congratulations on your performance at the World Cup, an interesting place to start is that you have played at the Olympics, the Commonwealth Games and now the World Cup, which of these was the best experience and why? RH: The London Olympic Games will always be at the top of the pile as one of the best sporting events I have ever experienced. However, for a hockey specific answer, this recent World Cup in The Hague was by far the most amazing hockey experience I have ever had. The Olympics is the pinnacle of every athletes competition and London delivered on every front. Whereas, the Netherlands is arguably the home of hockey, the passionate supporters and the professional manner in which this tournament was executed made it a spectacle I will never forget. ATJ: South African Hockey has famously struggled for sponsorship, how has this affected your personal development in the game? 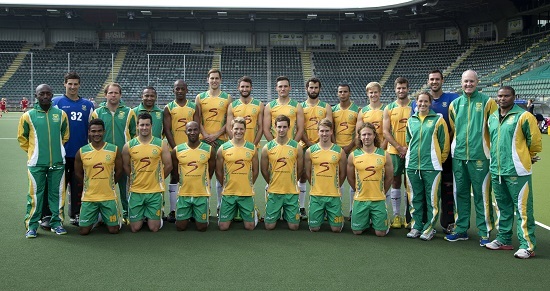 RH: The lack of a national league is a major problem for South African Hockey. The best players of our country only compete against each other for one week of every year in our annual Inter Provincial Tournament. Naturally this, in combination with no centralised national training program, have knock-on effects of a lack of individual development for the younger players. I have been very fortunate to have been based in Holland for the past 4 years and this has truly helped me learn, grow and develop as a player. ATJ: You also famously got to captain the Lads in Argentina. How was that experience and was it hard to fill Austin’s boots? RH: I am not so sure about the famous part but yes, I was very fortunate to captain South Africa for a few test matches. It was the highest honour of my career. Austin and I are different types of leaders so I never felt I had to fill his shoes but rather build on what he had already established with my own twist. ATJ: So it bodes an obvious question to follow up. Would you like to captain the team again? RH: If the responsibility is required of me I will happily do the job to the best of my ability. However, we are extremely fortunate to have a strong leadership group of players with Austin at the helm so I can not see that being required anytime soon. ATJ: Okay moving away from captaincy and into competition, can you tell us just how tough is the African Cup of Nations really is? RH: I truly believe people underestimate the difficulty of this tournament. The African Cup of Nations is a difficult test of not only our hockey ability due to some rather shambolic facilities but also a test of character. You will be faced with a variety of interesting scenarios when competing in Africa, especially when you are the nation that everybody wants to beat in order to qualify for the Olympic Games or World Cup. ATJ: After following what happened in Kenya, we were extra proud of the team for qualifying! Moving on, who has been the toughest striker you ever played against? RH: It is a close race between Jamie Dwyer (Australia), Constantijn Jonker (Holland) and Christopher Zeller (Germany). 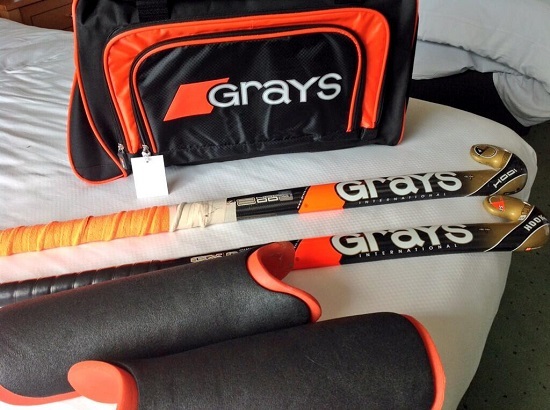 ATJ: You are sponsored by Grays Hockey, so which stick do you use and why do you like it? RH: I use the Grays GX 8000. I enjoy the shape and weight distribution of the stick which allows me to distribute in a variety of ways. ATJ: You are not a goal scorer on the International stage, but is there a club goal that you have scored that stands out in your memory? RH: Thanks for the reminder 🙂 To be honest, every goal I score stands out because they are so few and far between. I was convinced I was going to get my name on the scoresheet at the World Cup but my plans were foiled by some good goalkeeping. ATJ: We believe that goal for the Lads is coming! Having been on a fair amount of tours now, who can you categorically confirm is the team joker? RH: I have a funny feeling that my team mates may point their fingers in my direction but everyone has their moments of being the team clown. It simply depends on who becomes bored first. ATJ: And who do you get the luxury of rooming with? RH: It varies on tour but my longest standing room mate has been Lloyd Norris Jones. ATJ: South Africa have gone through a few coaching changes of late, how does this affect your preparations? RH: It can become a bit difficult for the team to adapt to what style of play, tactics and general themes the new coach is trying to implement. We have to gel and problem solve quickly especially considering the limited time we spend together. ATJ: What has been the highlight of your career so far? RH: The two that stand out the most are walking into the stadium of the Opening Ceremony of The Olympic Games and hugging my father after my 100th appearance for South Africa at the World Cup in The Hague. ATJ: Are there any young players from the U21 side that you think will have an epic SA career? RH: This upcoming group is very strong but the question is always: Can they adapt and become comfortable at the highest level of international hockey? In saying that, Dylan Swanepoel is someone you should keep your eye on. ATJ: Okay away from hockey, what other sports are you a fan of and who do you support? RH: I enjoy a variety of sports and can often be found playing golf, surfing my 9ft longboard or just climbing/trail running up a mountain. ATJ: Having achieved so much in your career, if you could leave youngsters one piece of advice, what would it be? RH: Life is a garden, dig it. On a serious note, I think the key learning I have discovered is that no matter who you are, where you have come from or what your current situation may be – it is paramount to strive toward being better than you were yesterday. RH: Twitter: @RhettHalkett. Instagram: Rhett.Halkett although my iPhone is currently under construction. ATJ: Thank you Rhett! Good luck with preparations for the Commonwealth Games! Catch Rhett and the rest of the Lads tackle the Commonwealth Games starting in mid-July!